Between 1905 and 1925, a wide range of substantial, quality homes were built in Centennial Park, featuring a mixture of Federation, Arts and Crafts, Victorian and Old English styles. With historic homes comes a unique range of wiring issues that the electricians at Randwick are capable of servicing. At Randwick Electrical we strive to be your team of go-to electrician in Centennial Park. For optimum smoke detection, smoke alarms should be installed in every room, living area and hallway of your residence or business in Centennial Park. This is very important where occupants sleep or work with a closed door. In multi-level buildings, we recommend additional smoke alarms be installed in the path of travel between each level. With Randwick on your side, it’s easy to bring your building up-to-code. Our friendly team combines years of experience to offer clients the best service and repair solutions to all hot water, cooling and heating units throughout the Eastern Suburbs. We understand that when one of your appliances isn’t working correctly it can be a huge inconvenience. Therefore, we endeavour to fix or maintain your utilities to their correct working as quickly as possible and without cutting corners. Want to make your home more energy efficient? We are a friendly team of electricians who understand that you want a reliable and cost-efficient solution. Look no further than Randwick Electrical Services when choosing an electrician for your home. Personal, Reliable Electricians in Centennial Park! 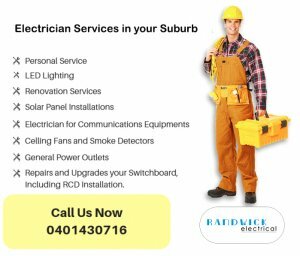 Our skilled team of local Sydney electricians at Randwick Electrical is small enough for you to get personal, reliable service, and at a good price. When you call Randwick Electrical you get gold-class service! That means we treat every client with the same respect and attention. Whether you’re a developer looking for various types of wiring for a subdivision of town homes, or a busy mom who needs a quick household repair, we welcome your business.